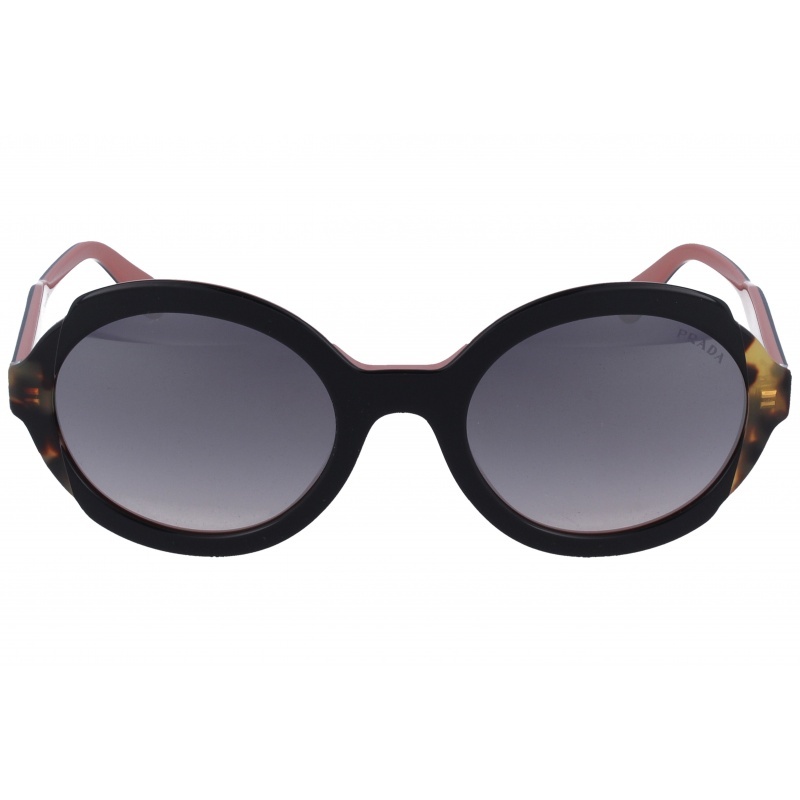 Sunglasses by the brand PRADA Sport for Women’s sunglasses, with reference S0007449, with a(n) Formal, Modern and Original style.Prada 51Ss 1Ab0A7 54 22 they have a(n) Full Rim frame made of Metal with a(n) Round and Oval shape in Black and Golden colours. Their size is 54mm and their bridge width is 22mm, with a total frame width of 76mm. They have Polycarbonate, Gray, Gradient lenses. These glasses are suitable for prescription lenses. These are top of the range glasses from the brand PRADA Sport, made of high-quality materials, modern glasses that will give you a look that matches your image. Buy Prada 51Ss 1Ab0A7 54 22 sunglasses in an easy and safe way at the best price in our online store. Sunglasses by the brand PRADA Sport for Women’s sunglasses, with reference S0007371, with a(n) Formal, Modern and Original style.Prada 51Ss 1Ab2B0 54 22 they have a(n) Full Rim frame made of Metal with a(n) Round and Oval shape in Black and Silver colours. Their size is 54mm and their bridge width is 22mm, with a total frame width of 76mm. They have Polycarbonate, Silver, MirrorUniform lenses. These glasses are suitable for prescription lenses. These are top of the range glasses from the brand PRADA Sport, made of high-quality materials, modern glasses that will give you a look that matches your image. Buy Prada 51Ss 1Ab2B0 54 22 sunglasses in an easy and safe way at the best price in our online store. string(132) "Buy Prada 51Ss 1Ab2B0 54 22 sunglasses. Modern and elegant model. Original product with fast shipping, quality guarantee and refund." string(28) "Prada 51SS 1AB2B0 Sunglasses"
string(23) "Prada 51Ss 1Ab2B0 54 22"
string(129) "Prada is a synonym of exclusiveness and style. An icon within the fashion sphere which radiates tendency in any of its creations." Sunglasses by the brand PRADA Sport for Women’s sunglasses, with reference S0007366, with a(n) Formal, Modern and Original style.Prada 51Ss 2Au5L2 54 22 they have a(n) Full Rim frame made of Metal with a(n) Round and Oval shape in Havana and Golden colours. Their size is 54mm and their bridge width is 22mm, with a total frame width of 76mm. They have Polycarbonate, Pink, MirrorUniform lenses. These glasses are suitable for prescription lenses. These are top of the range glasses from the brand PRADA Sport, made of high-quality materials, modern glasses that will give you a look that matches your image. Buy Prada 51Ss 2Au5L2 54 22 sunglasses in an easy and safe way at the best price in our online store. string(132) "Buy Prada 51Ss 2Au5L2 54 22 sunglasses. Modern and elegant model. Original product with fast shipping, quality guarantee and refund." string(28) "Prada 51SS 2AU5L2 Sunglasses"
string(23) "Prada 51Ss 2Au5L2 54 22"
string(132) "Buy Prada 51Ss Uao1C0 54 22 sunglasses. Modern and elegant model. Original product with fast shipping, quality guarantee and refund." string(28) "Prada 51SS UAO1C0 Sunglasses"
string(23) "Prada 51Ss Uao1C0 54 22"
Sunglasses by the brand PRADA for Women’s sunglasses, with reference S0010163, with a(n) Modern, Elegant, Glam, Original and Female style.Prada 19Us 1YC45S0 58 18 they have a(n) Full Rim frame made of Acetate / plastic with a(n) Cat Eye shape in Black and White colours. Their size is 58mm and their bridge width is 18mm, with a total frame width of 76mm. They have Organic, Gray, Uniform lenses. These glasses are suitable for prescription lenses. These are top of the range glasses from the brand PRADA, made of high-quality materials, modern glasses that will give you a look that matches your image. Buy Prada 19Us 1YC45S0 58 18 sunglasses in an easy and safe way at the best price in our online store. string(133) "Buy Prada 19Us 1YC45S0 58 18 sunglasses. Modern and elegant model. Original product with fast shipping, quality guarantee and refund." string(24) "Prada 19Us 1YC45S0 58 18"
Sunglasses by the brand PRADA for Women’s sunglasses, with reference S0010088, with a(n) Modern, Elegant and Female style.Prada 16US 5ZWGR0 54 21 they have a(n) Full Rim frame made of Acetate / plastic with a(n) Square shape in Black and Salmon pink colours. Their size is 53mm and their bridge width is 22mm, with a total frame width of 75mm. They have Organic, Silver, Gradient lenses. These glasses are suitable for prescription lenses. These are top of the range glasses from the brand PRADA, made of high-quality materials, modern glasses that will give you a look that matches your image. Buy Prada 16US 5ZWGR0 54 21 sunglasses in an easy and safe way at the best price in our online store. string(132) "Buy Prada 16US 5ZWGR0 54 21 sunglasses. Modern and elegant model. Original product with fast shipping, quality guarantee and refund." string(192) "prada 13qs 2au6s1 54 20,form unisex,acetate,metal,rectangular,round,square,juvenile,rod lens,organic,graduating,monofocal,quality,price,discount,cheap glasses,eyeglass quality,original glasses"
string(23) "Prada 16US 5ZWGR0 54 21"
string(132) "Buy Prada 17US 5ZWGR0 53 22 sunglasses. Modern and elegant model. Original product with fast shipping, quality guarantee and refund." string(23) "Prada 17US 5ZWGR0 53 22"
Sunglasses by the brand PRADA for Women’s sunglasses, with reference S0009970, with a(n) Modern, Elegant, Glam, Original and Female style.Prada 66TS MRU130 54 20 they have a(n) Full Rim frame made of Acetate / plastic with a(n) Cat Eye shape in Gray, Golden and Transparent colours. Their size is 54mm and their bridge width is 20mm, with a total frame width of 74mm. They have Organic, Gray, Gradient lenses. These glasses are suitable for prescription lenses. These are top of the range glasses from the brand PRADA, made of high-quality materials, modern glasses that will give you a look that matches your image. Buy Prada 66TS MRU130 54 20 sunglasses in an easy and safe way at the best price in our online store. string(132) "Buy Prada 66TS MRU130 54 20 sunglasses. Modern and elegant model. Original product with fast shipping, quality guarantee and refund." string(23) "Prada 66TS MRU130 54 20"
Sunglasses by the brand PRADA for Women’s sunglasses, with reference S0009861, with a(n) Formal, Elegant and Female style.Prada 16US KHR0A7 54 21 they have a(n) Full Rim frame made of Acetate / plastic with a(n) Square shape in Black and Blue colours. Their size is 54mm and their bridge width is 21mm, with a total frame width of 75mm. They have Organic, Brown, Gradient lenses. These glasses are suitable for prescription lenses. These are top of the range glasses from the brand PRADA, made of high-quality materials, modern glasses that will give you a look that matches your image. Buy Prada 16US KHR0A7 54 21 sunglasses in an easy and safe way at the best price in our online store. string(132) "Buy Prada 16US KHR0A7 54 21 sunglasses. Modern and elegant model. Original product with fast shipping, quality guarantee and refund." string(192) "prada 32ps 2au6s1 57 17,form unisex,acetate,metal,rectangular,round,square,juvenile,rod lens,organic,graduating,monofocal,quality,price,discount,cheap glasses,eyeglass quality,original glasses"
string(23) "Prada 16US KHR0A7 54 21"